Howe filed this group of negatives after his Barranca del Cobre and Baja California negatives. The original negative numbers and enclosures suggest that the negatives may be copies of photographs taken by Charles LaMonk. Most of the negative nos. (14 [sic], 1000, 1002, and 1004 – 1009) are prefaced with “LaMonk” and various other numbers, for example, “6 LaMonk 1007.” The numbers do not fall within the the sequence and numbering pattern of Howe’s negative numbers. 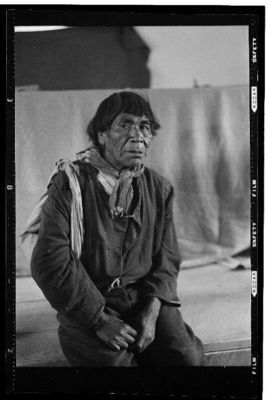 Portraits of Tarahumara Indians: a man holding a hat, a man in a cape, several other groupings of men, and two people with oven at Citecha in the background. Negative ASA001-1321 was discarded as it had crumbled into tiny fragments.